Charles Brock's background as a book cover designer has had a definite influence on the subject matter of his photographs. His interest in typography and letterforms lead to a common theme of signage, from slick complicated neons to barely legible hand lettered signs. 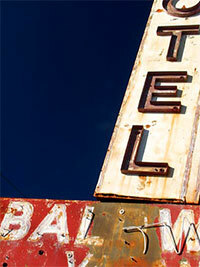 Charles' hunt for interesting old signs has lead him to shoot all over the United States including historic route 66, Las Vegas, Reno and along highway 99 in Seattle. Raised in Oklahoma, Charles currently resides in Bend, Oregon with his wife Kimberly. His images can be seen at www.brockimages.com.